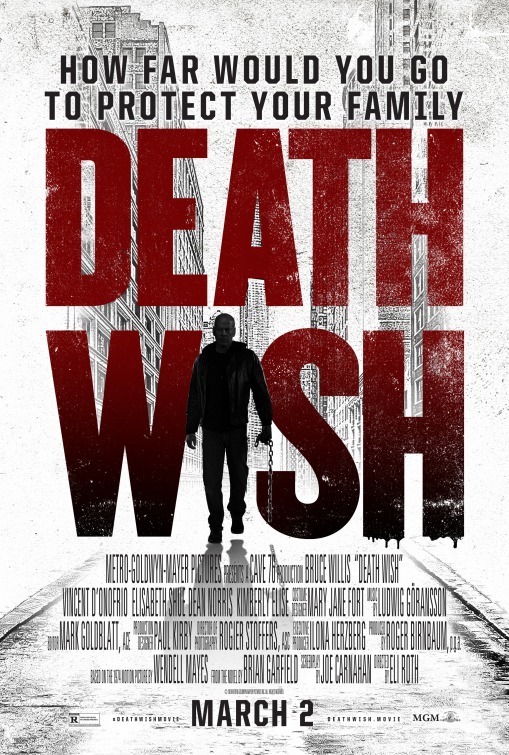 A 2018 update of “Death Wish” is probably not a film we need, particularly right now when gun control has become a major issue up for debate, but unfortunate timing of release doesn't determine the quality of the product itself. 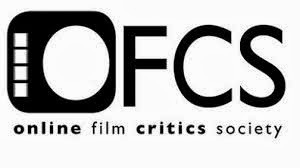 Like the 1974 Charles Bronson-starring exploitationer—which spawned four diminishing sequels—the film is another loose adaptation of Brian Garfield’s 1972 novel, but director Eli Roth (2015’s “The Green Inferno”) and screenwriter Joe Carnahan (2012’s “The Grey”) fashion a more ruthlessly motivated tale of vengeance, while transplanting the story from New York to Chicago and changing the protagonist’s occupation from architect to trauma surgeon. It, once again, broaches thorny questions about the morality of vigilante justice, but really, this is just a pulpy, no-fuss, down-and-dirty revenge thriller that doesn't get hung up on highbrow substance. Chicago surgeon Dr. Paul Kersey (Bruce Willis) has a loving, wonderful wife, Lucy (Elisabeth Shue), and a bright, athletic 17-year-old daughter, Jordan (Camila Morrone), who just got accepted into NYU. When Dad gets called in for surgery on his birthday, Lucy and Jordan are besieged by armed home invaders who rob them, put a bullet in Lucy, and put Jordan in a coma. Paul is devastated to find his wife and daughter brought into his hospital, and after putting his wife in the ground, he has lost everything. Struggling with the fact that he was unable to protect his family and frustrated that the police assigned to his case, Detectives Kevin Raines (Dean Norris) and Leonore Jackson (Kimberly Elise), have no leads, Paul begins to take matters into his own hands and seek justice on the streets of the Windy City. Getting a feel for firing a gun in the name of protecting the innocent, a hooded Paul is recorded by a witness whose video goes viral, his act of vigilantism marking him “The Grim Reaper,” but that won’t stop the good doctor from playing judge, jury and executioner on the men who have taken out his family. Staying within Eli Roth’s violent wheelhouse, “Death Wish” isn’t deep or any more tasteless than any other vigilante thrillers. The film doesn't seem self-aware enough or pointed enough in its stance on warranting violence, but when it is being squarely about revenge, it delivers pretty well. Interesting, how Roth (who put himself on the map with “Cabin Fever” and the “Hostel” films) helms this remake after James Wan (who cut his teeth on “Saw”) made his third film with 2007’s “Death Sentence,” itself based on another one of Garfield’s novels and a searing, more devastating “Death Wish” variation with Kevin Bacon. The film is most absorbing in its first act, setting up Paul Kersey as a Hippocratic Oath-abiding man who saves people for a living and is such a pacifist that he won’t deck an obnoxious, foul-mouthed father at his daughter’s soccer game. Enough rooting interest is invested in the Kersey family, introduced so happily with the use of The Beach Boys’ “Don’t Worry Baby” playing on the soundtrack, that the viewer really hopes nothing bad happens to them. Set today, the film fixes some of the inherent problems of the original film. If one forgets, Charles Bronson’s Paul Kersey never actually found the three men who raped his daughter and killed his wife, but he instead cleaned up the city of New York, which was littered with muggers on every block before Rudy Giuliani made improvements. His grief was merely a catalyst for taking the law into his own hands. Here, Bruce Willis' Paul is responsible for taking a number of lives, a few casualties that feel extraneous, but it’s not a tough request to stand behind Paul in hunting down the animals guilty of killing his wife and putting his daughter in critical condition. When he takes that power to the next level, gunning down carjackers and drug dealers and partaking in a shoot-out in a heavily populated nightclub, it edges closer to a morally dubious crowd-pleaser that seemingly condones Paul’s decisions than a cautionary tale. There is, however, a Greek chorus of sorts with Sirius Radio’s Sway Calloway and Mancow Muller, debating on whether the actions of “The Grim Reaper” are heroic or villainous. The film also ridicules how someone can easily buy a gun without much paperwork when Paul walks into firearms store Jolly Roger’s and gets the rundown by super-perky owner Bethany (Kirby Bliss Blanton). As the film’s appointed hero, Bruce Willis is in fine form without too much smug smirking; in fact, he effectively brings more understatement than expected to Paul Kersey, particularly in the way he grieves over his wife, before packing heat and emulating Charles Bronson’s trigger-finger gesture in the last frame. Elisabeth Shue is lovely as usual as Lucy Kersey and brings heartbreaking tragedy and dignity to her abbreviated screen time, while Camila Morrone, as daughter Jordan, has a sweet, eye-catching presence about her without becoming an afterthought when she’s not yet awake in a hospital bed. 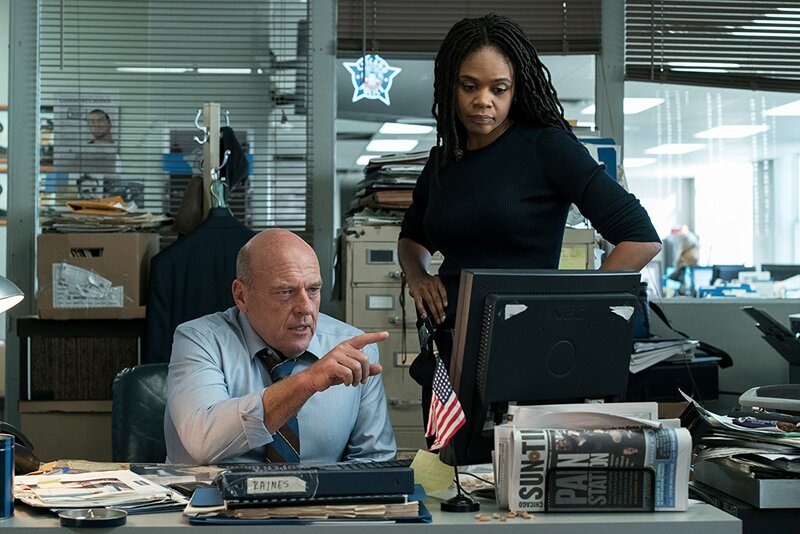 Dean Norris and Kimberly Elise make an odd pair of detective partners with a comfortable chemistry, and Vincent D’Onofrio provides strong sounding-board support as Paul’s deadbeat brother Frank. 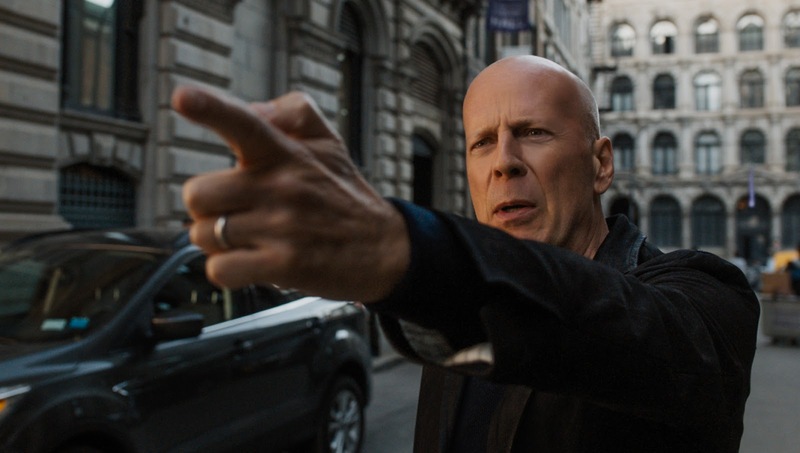 2018’s “Death Wish” is slickly made, with the pivotal home-invasion harrowing and thankfully less exploitative than the 1974 version, and moves at a tighter, more focused clip. There are contrivances, to be sure, to move the narrative along, like Paul collecting a gun that falls out of a flatlining patient’s jacket and later stumbling upon a carjacking, but the standard final showdown in the Kersey home is satisfying and tautly staged with a gleeful buzz. Also, a couple of the gore gags are decidedly of the don’t-try-this-at-home variety with Roth’s splatterific trademarks all over them, like a conveniently falling bowling ball on a baddie’s head, brake fluid on a freshly sliced-open limb, and a car jack in an auto-body shop crashing down on a lowlife. 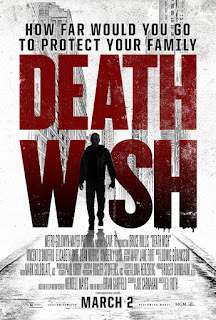 Though the idea of getting revenge as a form of catharsis without solving anything has been handled with more power and thematic complexity in other films before it, “Death Wish” still fulfills its B-movie aims, remaining watchable without making one feel too unclean.